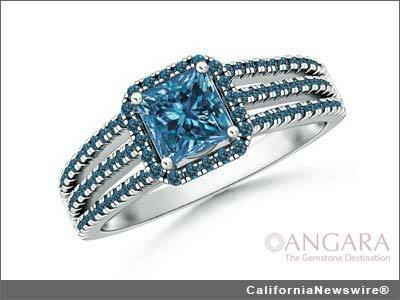 LOS ANGELES, Calif. /California Newswire/ — The international online jewelry store, Angara Inc. (Angara.com) decides to kick start their "Early Cyber Monday" deal from today and will have daily deals up until Cyber Monday December 2, 2013. The store is offering incredible online savings that include a huge discount up to 15 percent on the entire range of jewelry at the store with free garnet studs of $199 on all orders today. Traditionally, early Cyber Monday deals start from Friday following Thanksgiving Day but after the overwhelming response of customers last year, the store has decided to start the deals a week before the biggest online shopping day. To help customers even saving more, Angara is also offering free international shipping and 60-Day returns on all orders. It is the holiday season, the most awaited time of the year to shop and to celebrate. But the current economic conditions have greatly restricted buyers from exceeding their limits. Understanding the customer requirements and market conditions, Angara has decided to offer best discounts and deals early before Cyber Monday. Angara's mobile site customers, email subscribers, Facebook and Twitter fans will be the first to receive updates about "Early" Cyber Monday and other holiday season deals. The store has an ample of options along with its best sellers in the collection to choose. Along with white diamonds, sapphires, emeralds and rubies, customers will be able to access a whole new range of enhanced blue and black diamond collection, black onyx and moissanite jewelry. The improved categories such as diamond studs and the newly introduced ones like men's and women's bands are other attractive features at the online store. With early deals and lucrative discounts, customers could enjoy fine and trendy jewelry within the budget limits. The "Early Cyber Monday" sale is the start of holiday deals at the store. This will be followed by Thanksgiving and Black Friday offers. More information: http://www.angara.com/ . Angara.com is an online fine gemstone and diamond jewelry retailer. We are specialists in gemstone jewelry including sapphire, ruby, emerald, tanzanite and birthstone jewelry. We save our customers over 40 percent vs. other jewelry retailers by manufacturing our own jewelry and many of our gemstones. We have direct sourcing capabilities in the world's gemstone centers – Jaipur and Bangkok. We offer the unique ability to customize your jewelry by choosing different metal, gemstone size and gemstone quality options. Angara.com has been covered extensively in the press including coverage in America's Next Top Model, Forbes, Crains New York, and WWD. Address: Angara Inc., 550 South Hill St, Suite 1625, Los Angeles, CA 90013.